INDIANAPOLIS (March 24, 2014) — Klipsch, a leading global speaker and headphone manufacturer, today unveils five new professional cinema surround speakers at CinemaCon 2014 in Las Vegas. Including two 8-inch woofer models (KPT-8000-M and KPT-8060-H) and three 12-inch woofer designs (KPT-1200-M, KPT 1260-H and KPT-1200-VBM), these high-aesthetic, molded-cabinet models present a contemporary look that blends perfectly into today’s modern cinemas. Designed for flexible ceiling or side-wall placements, the new range of models include solutions that are perfect for everything from small, budget-conscious venues to grand auditoriums. Like all Klipsch surround speakers, the new speakers perfectly timbre-match Klipsch behind-screen systems for a seamless, immersive presentation. For placement flexibility, all models incorporate 8-degree or 15-degree angles with threaded inserts to accommodate optional Klipsch or industry standard brackets. Klipsch’s proprietary Tractrix® Horn technology provides critical low-distortion clarity with high-efficiency for maximum output per watt. The addition of elliptical inserts, or “mumps”, into the horns enhance coverage across the full dispersion area of the horn. Depending on the model, either a 90-degree by 60-degree or a 100-degree by 100-degree dispersion pattern provides multiple options in covering a wide range of auditorium sizes with immersive sound. 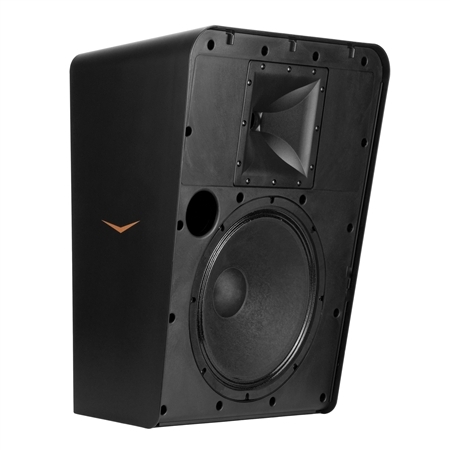 Additionally, the KPT-1200-VBM incorporates Klipsch’s Virtual Boundary Array Technology (VBAT) using a pair of skewed horns that cover 140-degrees horizontally with a tight 60-degree vertical pattern that flawlessly delivers broad sounds with detailed surround information. Enabled with a wide pattern, the VBAT technology takes full advantage of advanced, digital sound formats. The five new Klipsch professional cinema surround speakers debuting at CinemaCon 2014 will be available for purchase in May. For more information on the Klipsch brand and its product offering, visit Klipsch.com.